After 6 weeks of online voting where fans got to choose their top players, a draft for the top 12 players was held last June 7 at the Music Hall of SM Mall of Asia to officially complete the pool of players under Team Chris and Team Marc for the Master Game Face Challenge Year 2 slated on June 21, 2014 at 7pm at the Smart Araneta Coliseum in Quezon City. Master, the no. 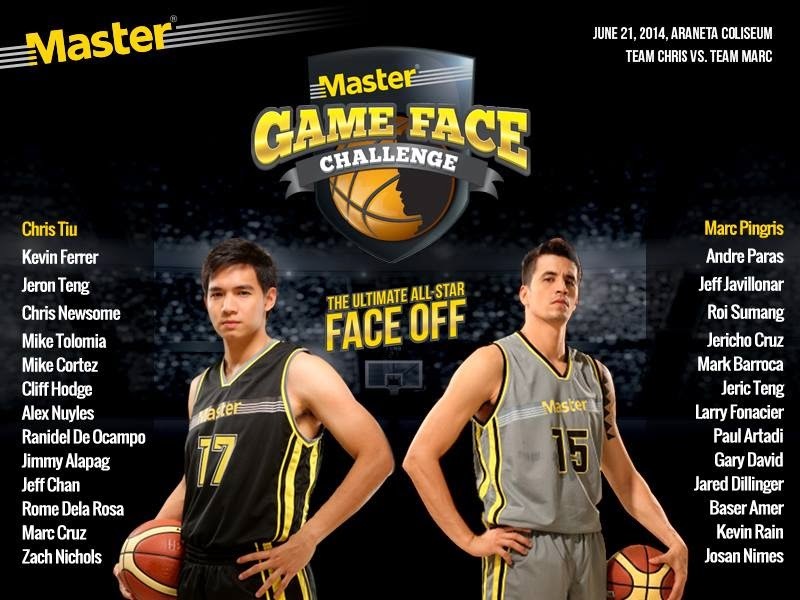 1 face care brand for men, brings you the Master Game Face All-Star Basketball Challenge that will feature two all-star basketball teams led by two basketball superstars of this generation -- Rain or Shine’s Chris Tiu and San Mig Coffee’s Marc Pingris. The game will put select Philippine Basketball Association (PBA) players and collegiate all-star basketball players will surely be a more exciting match. It will also feature NBA superstar and Minnesota Timberwolves Power Forward Kevin Love doing his signature moves alongside dunkers from the USA. From a pool of 30 PBA players, Tiu selected Ranidel De Ocampo, Jeff Chan, Larry Fonacier, Jimmy Alapag, Jeric Teng and Alex Nuyles to backstop UAAP and NCAA collegiate stars Jeron Teng, Chris Newsome, Kevin Ferrer, Mike Tolomia, Rome Dela Rosa, Mark Cruz, and Zach Nichols. Pingris, on the other hand, chose Gary David, Mark Barroca, Mike Cortez, Jared Dillinger, Cliff Hodge and Paul Artadi to provide experience to his team composed of UAAP and NCAA standouts Andre Paras, Jeoffrey Javillonar, Jericho Cruz, Roi Sumang, Baser Amer, Kevin Racal, and Josan Nimes. Aside from the highly-anticipated match-up, the Master Game Face All-Star Basketball Challenge also promises basketball fans an equally thrilling halftime show courtesy of Minnesota Timberwolves’ star player Kevin Love who will be coming over to Manila for the first time. The 6’10” power forward is set to appear during the event to display his signature basketball moves and outlet passing in a skills challenge. The 2012 NBA 3-point shootout champion will also slug it out with some of the PBA’s best shooters in a 3-point shootout. Joining him as well will be basketball slam dunkers from the US to bring a truly memorable and exciting basketball fest. “We are excited to bring to the country three-time NBA All-Star player Kevin Love. Dubbed by the Associated Press as the new face of the Timberwolves franchise, we will see him put his Master game face on to electrify Pinoy basketball fans with his skills and signature moves to elevate Master Game Face to an even higher level this 2014,” said Jonathan Pua, Unilever Male Grooming brand manager. In the NBA’s 2013-2014 regular season, Kevin Love garnered a career-high 26.1 points per game, dished an average 4.4 assists and grabbed 12.5 rebounds. He also became the first player in NBA history to record 2,000 points, 900 rebounds and 100 3-pointers in a single season. With a complete line of face care products including facial wash, face cleansers and face moisturizers for the highly competitive sportsman, Master takes basketball to a whole new level. Oil can definitely reduce a player’s effectiveness in any game – especially in basketball. Boosting anti-oil protection, Master Oil Control Max Facial Wash has the revolutionary Cooling ZEROIL formula that controls oil for 8 hours for that fresh game face look to bring out the best in anyone’s game – even off the court. Get 8 hours of no oil with Master Facial Wash so you can put your game face on! You can also fight deep seated dirt that causes pimples with Master Oil Control Max Deep Cleanser. 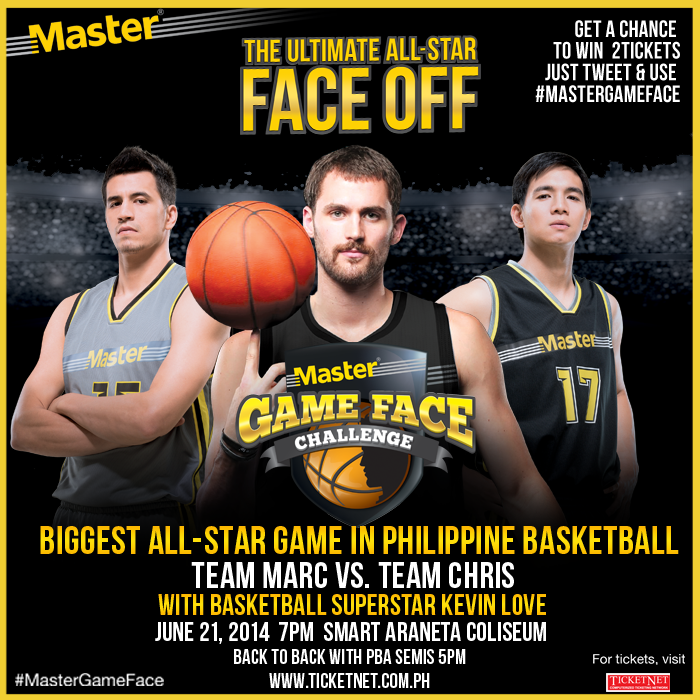 Tickets to the Master Game Face All Star Basketball Challenge featuring the PBA, UAAP and NCAA Players and NBA Star Kevin Love on June 21 at the Smart Araneta Coliseum can be purchased from Ticketnet outlets or by visiting Ticketnet’s Website at www.ticketnet.com.ph or call 911-5555.